The flexibility, durability and overall improved performance of radial tires over bias tires is a proven fact. 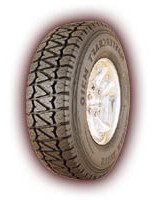 Radial tires also contribute to excellent fuel savings. Steel cord components are selected for optimum performance, including low rolling resistance. Belt cords are selected for strength and durability, while ply cords are selected for flexibility and fatigue resistance. All cords are specially designed for corrosion resistance and high adhesion to rubber.